Carte de l'Europe avant l'invasion des Barbares vers l'an 350. Carte de l'Europe apres l'invasion des Barbares vers la fin du 5e siecle. A fine first edition example of M. Lapie's map depicting europe before and after the so-called Barbarian Invasions, which saw the western Roman empire fall to Goths, Visigoths, and Vandals, and much of central and northern europe taken by Attila and his merry Huns. Historians now also use the term 'Barbarian Invasions' to refer to the simultaneous and more peaceable migration of Germanic peoples westward, including the first Anglo-Saxon settlement of Britain, when, for all intents and purposes, the Roman empire had ceased to exist. The map is divided into two parts, the upper half showing europe before the invasion of the Barbarians around the year 350 Ce, and the lower half showing europe post 'invasion' in the late 400s. 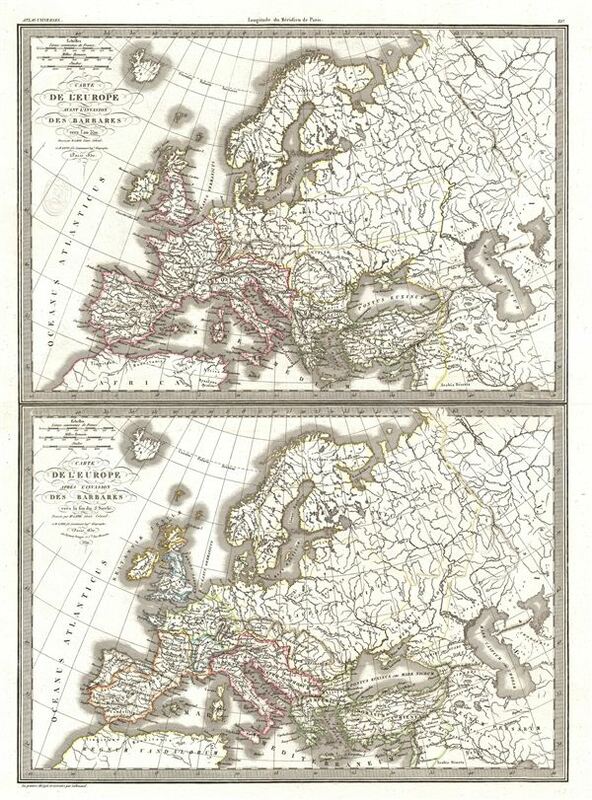 Both maps cover all of europe from the Atlantic Ocean to Asia, and from the Arctic to northern Africa. This map would make a fine companion map to Lapie's other historical maps of europe from the same atlas. engraved by Armand Joseph Lallemand as plate no. 15 in the first edition of M. Lapie's important Atlas Universel. This map, like all maps from the Atlas Universel features an embossed stamp from the Lapie firm. Rumsey 2174.015. Phillips (Atlases) 754, 765.